UPDATE: Tickets for Bacon and Beer Fest are now sold out. Please sign up on the waiting list to be alerted of any additional (unlikely) releases. Please also check out the other awesome Bacon and Beer events below. 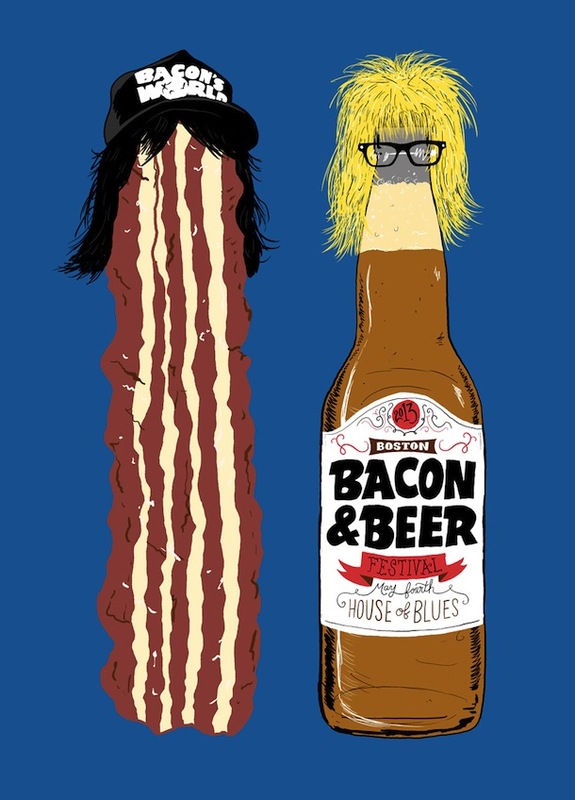 The 2013 Boston Bacon and Beer Festival will be held on May 4th, 2013 from 2:30PM to 5:00PM at House of Blues Boston. Once again, the Festival will be a fundraiser for Lovin' Spoonfuls and Community Servings. There will be restaurants and brewers from around the area sampling their finest bacon dishes and beers, along with about a hundred dozen people who love bacon and beer just as much as you do. Your ticket gets you in to Bacon and Beer Fest where you'll be able to sample the dishes and the beer. There will be other people there with the same intention, so remember to share. Bacon for this event generously donated by Zoe's Meats. On Sunday, May 5th, we'll set sail for Bacon de Mayo: A Bacon and Beer Karaoke Harbor Cruise Brunch featuring food from Rising Sun Tavern and beer from Smuttynose Brewing Company and High & Mighty. You and The People's Karaoke will provide the tunes while we cruise Boston Harbor. Each ticket entitles the purchaser to a three hours cruise, a complimentary Smuttynose and High & Mighty, along with a light brunch. High & Mighty and Smuttynose will be available for purchase for the entire cruise. Boarding begins at 11:30 at Gate C behind the Boston Harbor Hotel. What song are you going to sing? This is a 21+ rain or shine event. PURCHASE TICKET FOR THE HARBOR CRUISE HERE. Art and food go together so well. Last year we partnered with Super Precious Art Gallery to put together a Bacon and Beer themed art show. This year, Super Precious is putting together Hamburger Cheeseburger Hotdog: A tribute to backyard BBQ. On May 7th, come out to Stoddard's Food and Ale in DTX for 1 of 2 viewings. Enjoy contemporary art inspired by grilling from local and national artists while munching on bacony offerings from Stoddard's, and sipping on Bakon Vodka Bloody Mary's and sipping on $1 Bocks from Narragansett. BUY TICKETS FOR 6PM SHOWING. BUY TICKETS FOR 7:30PM SHOWING. Bacon and Beer Festival tickets will be $43 and go on sale to the general public on April 5th at 10AM. A large portion of tickets will be available to people on the Eat Boston mailing list on April 4th at 10 AM. An email will be sent out on the morning of April 4th the password for the presale. Please note we are reducing capacity by about 15% this year to help with crowding. For the MOST up to date information please sign up on the mailing list. Really, that's the best bet. You can also follow on Twitter and Facebook. 21st Amendment, Blue Hills Brewery, Sam Adams, Brooklyn Brewery, Cape Ann Brewing Company, Dogfish Head Craft Brewery, Harpoon Brewery, Left Hand Brewing Co, Mayflower Brewing Company, Ipswich Ale Brewery, Narragansett Beer, New Planet Beer, Newburyport Brewing Company, Paper City Brewing Company, Peak Organic Brewing Co., Rapscallion, Slumbrew, Smuttynose Brewing Company, Trinity Brewhouse, Watch City Brewing Co, Wells & Young's, Wormtown Brewery. Restaurants and breweries are subject to change. 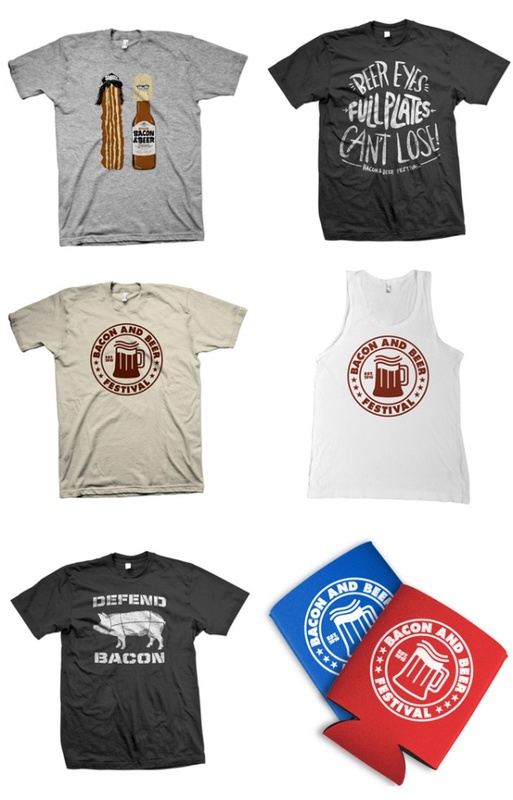 It wouldn't be Bacon and Beer Fest without some awesome merch from Josh LaFayette and Chris Piasick. Click below to buy all of it, please. Art show with Bacon and Beer on 5/7 6PM showing. Art show with Bacon and Beer on 5/7 7:30PM showing.